Chris Schembra is changing the world one dinner at a time. As the Founder and Chief Question Asker of the 747 Club, Chris dedicates his life to community building by bringing strangers together at his killer dinner parties. Today he shares why becoming a power connector helped him abandon his insecurities and find inner fulfillment. He also reveals how he turned his dinners into a thriving business model, talks about leading with the heart, and uncovers the greatest thing you can do to invest in your network. 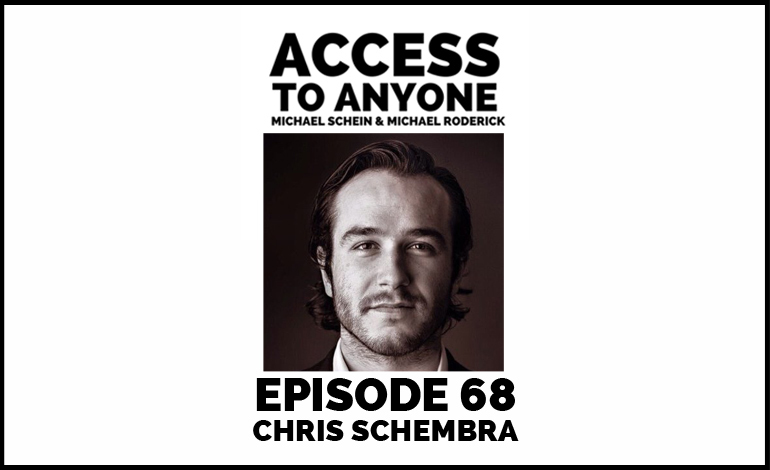 Chris Schembra is a leading expert on empathy and the art of human connection. He is the Founder + Chief Question Asker of the 747 Club, an organization which awakens empathy within people and corporations. Since it’s inception, the 747 Club has served over 1,900 attendees, sparking over 50,000 relationships. Aside from the 747 Club, Chris is a partner at OHenry Productions, which invests in and produces commercial theater, whose projects have been awarded 10 Tony Awards, 7 Emmys and a Grammy. As a marketer, he’s led campaigns with over 900,000 participants; and the programs through his family’s Hilton Head Island Performance Group have trained and empowered close to 1,000,000 (million) executives, salespeople, athletes, and students how to achieve excellence and gain the competitive edge.